Back in May you might remember us telling you about the Museum of the Year Photography Competition. Today, we are proud to announce that one of the ten finalist photographs is going on display in the Museum. Visitors were encouraged to enter their photographs inspired by each of the ten Museum of the Year 2013 finalists. 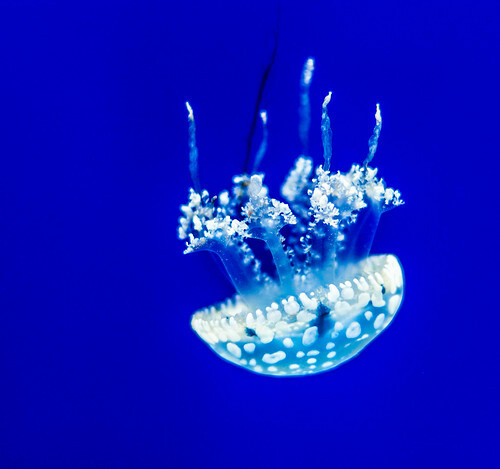 This photograph, by Oliver Hine, shows one of the jellyfish from our Aquarium. The judges selected this image to celebrate the Horniman's place as a finalist, as they felt it most creatively captured the spirit of the museum. Unfortunately, Oliver's photograph didn't win the competition, but it's definitely a winner in our eyes and today it goes on display in the main museum building. We interviewed Oliver to find out more about his photograph and how it felt to be exhibiting at the Horniman. How does it feel for your photograph to be selected to represent the Horniman in the final of the competition? It was fantastic to receive the news that my photo had been selected. The reaction from my friends and family was wonderful and since then I have found new confidence and enjoyment in my photography which I’m really pleased to be able to share with the Horniman, its visitors and supporters. Your finalist photograph is going to be exhibited in the Horniman Museum. Have you ever had your work exhibited before? Very recently one of my favourite photos, which won a competition with the photography society at my workplace, has been requested by some friends to display in their homes, but nothing like an exhibition at the Horniman! I’ve always had a camera but I took it up seriously with the purchase of my first DSLR 5 years ago. What do you get up to when not photographing jellyfish? This year will feature a lot of wedding planning as I am getting married to my beautiful fiancée Hanna next year! I am a software developer by trade and I have a few pet projects that I work on in my spare time. In terms of other photographic subject matter anything is game! Are you a regular visitor to the Horniman? We visited for the first time in April 2013 when I took this photograph. What made you decide to photograph the Horniman? I take my camera with me almost everywhere I go so I had it with me when I visited the Horniman. My fiancée Hanna pointed out the competition to me so I spent longer than normal hanging back taking photos whilst we were walking around! The jellyfish are popular subject for photographers at the Horniman. What made you choose them? The aesthetic simplicity and beautiful lighting of the jellyfish in their tank immediately drew my eye. I find jellyfish interesting from a scientific respect in that they function without a brain, heart or many other major organs we cannot imagine doing without but I imagine this allows them to have a very peaceful and serene life! Were they particularly tricky to photograph? The lighting in the jellyfish tank is particularly good, and the glass was nice and clean so the shot was relatively easy to take. Did you have any specialist kit to help you get the shot? Just my DSLR and 50mm prime lens! How many shot did it take for you to get your finalist photograph? I took about 8 shots of the jellyfish and chose based on the clean lines and razor sharp focus of the one I eventually entered. Do you think you’ll be back to shoot more scenes at the Horniman in the future? There are plenty of interesting exhibits we didn’t even have time to see on our visit, including the music section, so I’m sure I will be back in the future with my camera! We look forward to welcoming back Oliver and his camera. View more of Oliver's photography on Flickr. Don't forget you are free to take photographs to non-commerical use anywhere in the museum, so get snapping and don't forget to share the results with us in our Flickr group! Update: Here's Oliver with his finalist photograph on display in the main museum building.